One of the most used departure ports for cruise ships in the Caribbean is Old San Juan in Puerto Rico. We decided to arrive a day early to San Juan in order to see some sights before our cruise ship departure. San Juan, known as 'La Ciudad Amurallada' (the walled city), was founded in 1521 and is the oldest city under the US flag. During the 16th century, the Spanish used it as a point of departure for expeditions to the New World. 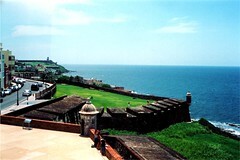 Fortifications in the Old San Juan section of the city repulsed numerous attacks from the English and the Dutch during those years. Today, Old San Juan is a charming seven square block commercial and residential area with cobblestone streets. The cruise ship terminal is actually located near the south side of so instead of booking a hotel in the beach resort area of San Juan, we decided to book one right in the old section for close proximity to the terminal as well as the local sights. The $17 US taxi ride from San Juan's airport to the old part of San Juan was about half an hour. During the ride, I was impressed by how developed the city was compared to many other cities I've visited in the Caribbean. 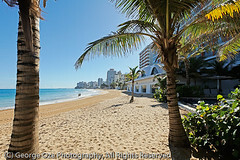 The beach high-rise hotels along the north side of San Juan were visible from the highway. Our stay for the night was at the Hotel Milano which is right on Calle Fortaleza, which is one of the major commercial streets. The hotel was clean and comfortable but not luxurious which was okay with us as the price was very affordable. Its quality was probably comparable to a Travelodge or Days Inn. A very pleasant surprise was the free continental breakfast at the hotel's rooftop restaurant. It gave a nice view of the neighborhood from the top.